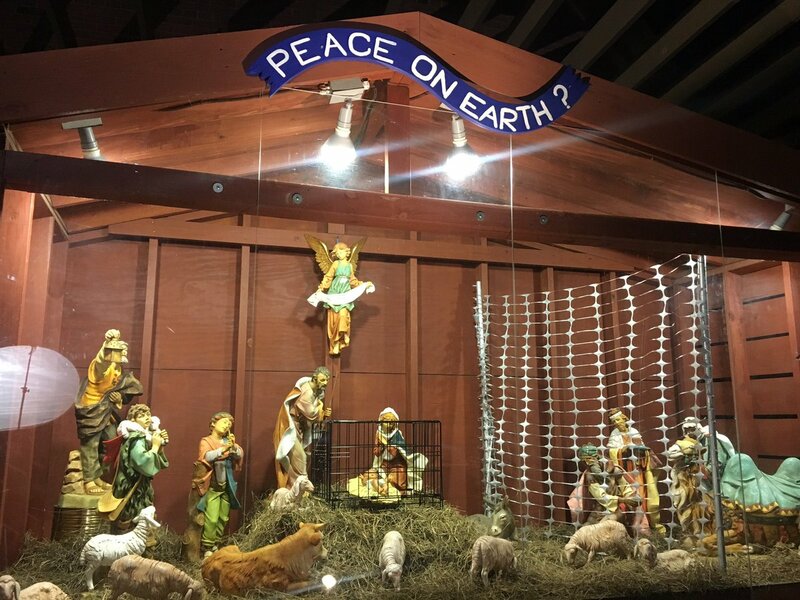 A church in Massachusetts has set up a nativity scene in which the baby Jesus is inside a small steel cage, under a banner that reads "Peace on Earth?" The idea for the divided nativity scene came out of a meeting of the congregation’s Pax Christi committee, a group that gathers monthly and “seeks to educate the community on matters related to peace and justice,” according to the church’s website. The setup shows baby Jesus enclosed in a cage, with Mary and Joseph looking over him. To the right of them, the three wise men are visible behind a net that extends from the ground to the stable’s ceiling, to “keep out foreigners,” Josoma said. The church did a message-based nativity scene last year as well, that one about gun control. Above Mary, Joseph, and the baby Jesus there were 16 signs listing the locations of the worst mass shootings in the U.S., along with the death counts. Meanwhile, the Chicago chapter of the Satanic Temple has erected a "Snaketivity" statue that it successfully forced officials to display next to a huge Christmas tree in the Illinois Statehouse rotunda just in time for the holiday season. The statue, which features a hand holding up an apple with a serpent wrapped around it, is now included alongside a Nativity scene and a Hanukkah menorah. It's title, "Knowledge Is The Greatest Gift," overtly mocks the idea of Christ as God's great gift to the world. I'm a xtian, but I'd just stand there chuckling, seeing this. What the hell do I care about the baby Jesus painted statues?! This Statues represent only a HANDFUL of travellers, who return to their village or countries, at the end. They are NOT living INVADERS ingtent on knocking down fences, taking jobsd and hand-outs, welfare, medical aid, free education, and other benefits from tax payers. Joseph and Jesus worked their tails off, as carpenters. And Mary was a housewife.